YES, It's REAL OAK WOOD! As you begin to read this description, can you start to imagine what it would be like to play chess on this beautiful table? 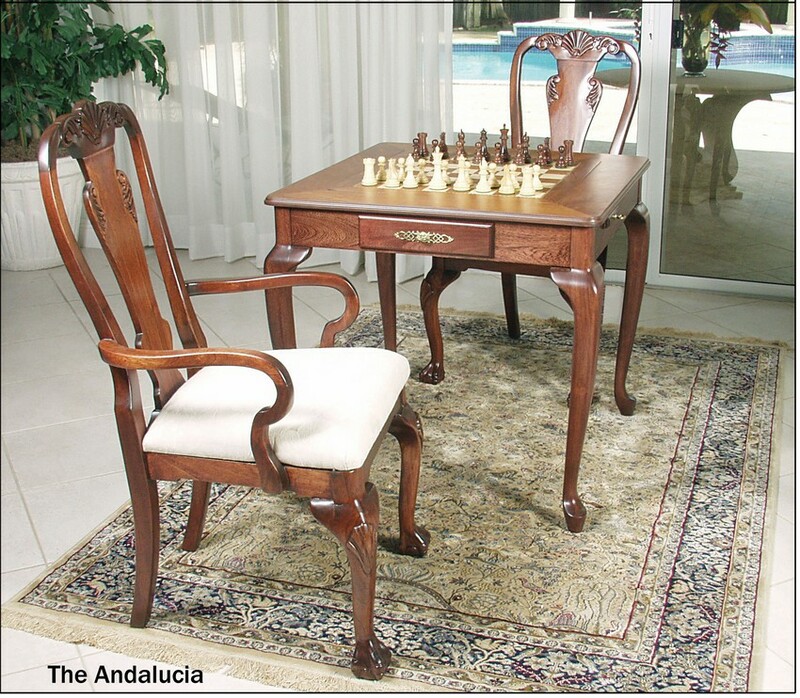 The Andalucia table is a beautiful Chippendale-style table featuring a beautiful cherry finish. 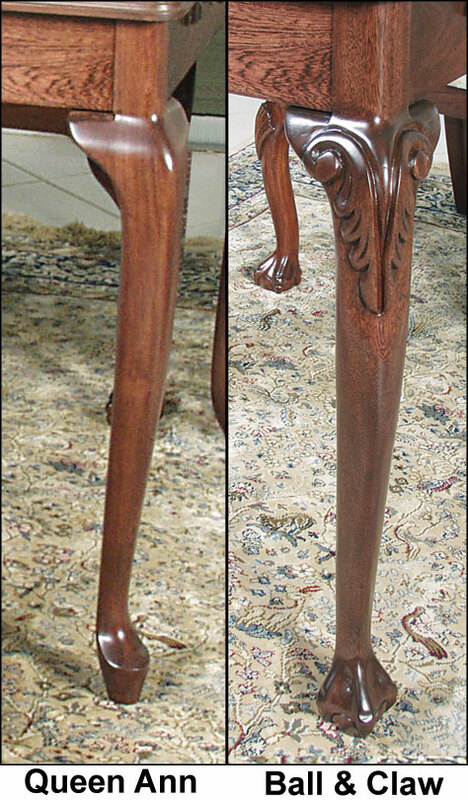 In case tradition is more your style, we also offer this table with a Ball and Claw Leg. This table offers you strength, stability and an antique touch that can't be found anywhere else. She also has plenty of room for "captured" pieces along with a standard chess clock. Ensuring that your chess matches will be comfortable. The table also has two drawers on each side for storage. Keep your favorite books right in there for easy access. Another simple, yet luxurious feature of this table are the cup holders on the side. Simple slide them out and place your beverage there or leave it inside for an elegant "flushed" look. . The body/table is built with carefully selected Oak woods (from the finest lumberyards in South America) and a Red Mahogany finish is applied. The wood is then dried to an 8% level to ensure no cracks and expansions occur later on in the chess tables life. The playing board is made with veneers using South American Rosewood for the dark squares and Birds Eye maple (Imported from USA) for the white squares giving it a touch of finesse and originality. Between the playing squares and the edge of the table is a beautiful 1/8" wide strip of woods that give the playing board character. The playing board is absolutely beautiful when seen from up close. Assembly and disassembly of the legs is extremely easy. Table can be assembled in less than 5 minutes. The oak wood makes this table even more solid. Not only is it sturdier, but it is heavier as well. The table's frame is ruggedly constructed using Solid Oak, however, the top of the table (the actual board) is made with fancy rosewood, bird's eye maple veneers, and fancy inlay work to separate the playing board from the rest of the table top. The squares are made with Birds eye maple which give this table's white squares a fine luster. 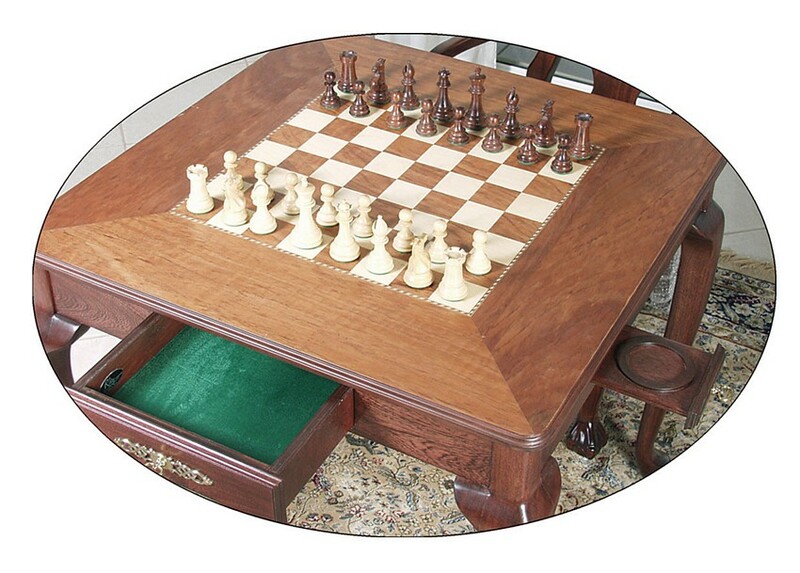 You'll be able to flip the chess board over to make this table a great "occasional multi purpose table". Take a look at what the top looks like when you turn the table into an occasional table. Do you see that fancy veneer work? Now take the board/top off and here you have an indented backgammon board and boy this thing is beautifully fancy!! Don't you agree? If you take the time to take a closer look at the backgammon board, you'll see that this is a stunning piece of work! Each backgammon piece of board, is a carefully hand inserted piece of veneer. Not only that, but take a look at the inlay around the board!! As you begin to read this description, can you start to imagine what it would be like to play chess, checkers, or backgammon on this beautiful table? Or maybe you'll use it mostly to drink your coffee on Sunday mornings while you read the paper. Whatever your use will be, I'm sure that you'll enjoy every minute of it. Unlike our competitor's tables, our table can be assembled in less than 5 minutes. You will not have to put together the table from scratch, since our tables are 95% assembled. This is one of the reasons other tables may be so cheap. They are usually not assembled at all and you're the one that has to put it together. Besides it taking you a long time to put them together, they will never be as sturdy as a table that comes fully assembled from the factory. Ample room for captured pieces. 2 billiard cloth lined drawers. 2 slide out cup holders on each side of the table. Exotic woods for playing board. Made with Solid Oak wood. Dimensions: Table weights 60 pounds and measures 33"W x 33"L x 30"H. Squares are 2 1/4" x 2 1/4"
Additional Info: Chess Pieces NOT included. To ensure this table arrives to its final destination in safe condition, we ship it via freight forwarder. Shipping is $75 per table Chairs Ship for FREE.